An enormous privilege… invited to exhibit for the second time Singapores oldest contemporary art gallery Artfoum… respected owner and director Marjorie Chu… has selected new work and will be exhibited with Singapores finest artists …if you are in Singapore.. would you like to be my guest at this VIP Opening please message me on FB or the contact via my website. VIP Opening Thursday 15th and Art Party on Friday 19th November Fi Pit Building Singapore. New works of Water Ways and stories of the past are on exhibition until the 27th of May at Mundaring Arts Centre and in conjunction with the National Trust and the Heritage Festival free entry during the Festival. BBC reports the city of Cape Town is running out of water, yet the world focuses here, our city, the worlds worst effected area by climate change. Amongst this adversity, WA’s Water Corporation provides fine drinking water now and for thousands of years to come due to the innovative solutions and ideas of people, from CY O’Connor to the current engineers. 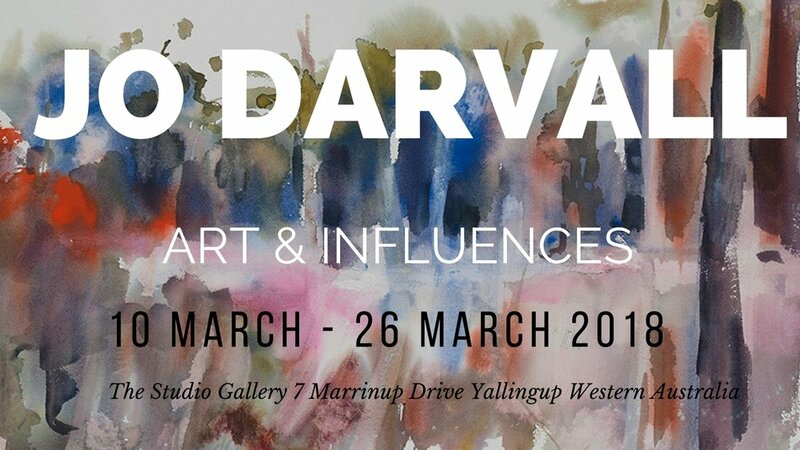 …Darvall’s exhibition, Like Water is relevant to the past and current day. 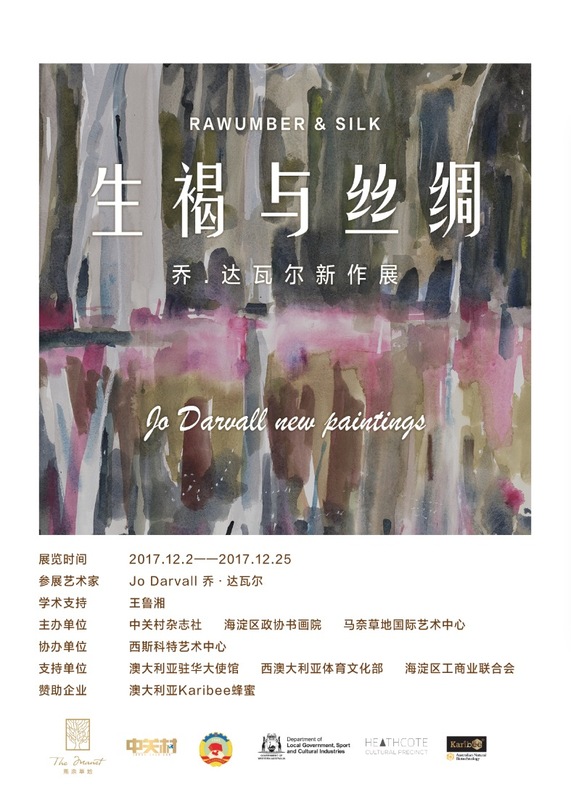 Jo Darvall re-imagines history with her impressive large scale silk panels funded by DCAs Creative Grant, previously exhibited at The High Commission in Singapore and at The Manet Club in Beijing will be exhibited in WA for the first time …at the Pump Station No 1 in Mundaring Weir in conjunction with the 2018 Heritage Festival. Understanding where we come from helps us define our future …in this exhibition held respectively in the main gallery of the Mundaring Arts Centre, Jo continues to pursue her commitment to pay homage to artist Kathleen O’Connor including paintings that reference both Kathleen and Kathleen’s father - the engineer of the pipeline to Kalgoorlie, CY O’Connor. On her retun from exhibiting in Asia, Jo’s more recent work also focuses on the beautiful waterways - ocean, rivers and lakes that define her adopted state of Western Australia. The new works titled Water Ways are a fusion of history spiced with old fashioned poetry ensuring a wonderus journey into ways of water, tantalizing and submerging our unique culture that provides the viewer an opportunity to re-imagine history. 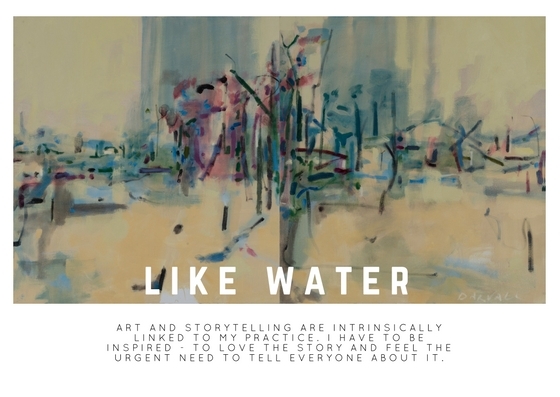 Like Water Exhibition opens on Friday 6th of April at the Mundaring Arts Centre. Red Gate Gallery and International Arts Residency Beijing moving to the arts district called 798 in the following weeks check them out they are so warm interesting and supportive! The biggest brush I have ever seen it is resting in a sea of 56 Dragons ... they represent the 56 different people from a range of religions and backgrounds that make up China ! All that is Changing, new art works representing the creative lives of Kathleen O’Connor and Georgette Chen at the Australian High Commission , Singapore during March and April 2017. In this exhibition I was trying to explore and celebrate the creative lives of female artists, highlighting their struggle and personal commitment to be creative. It seeks to reveal a unique time in history for the general public to engage with at a personable level. Artbanks recent road tour to WA gave me the opportunity to present my practice to the Curators they selected Sugar Loaf Road to collect. Sugar Loaf Road was one of the artworks from my exhibition at Sagra Art Gallery in Melbourne last year titled Reckless Romantics opened by Dr Chris McAuliffe pictured below in front of the painting. It depicts an area inland of the Tuross River NSW probably the end of the Blue Mountains where my husbands father Peter Darvall has rudimentary rock huts near an old gold mining village called Utopia this area and its stories became the basis for the exhibition and my investigation in our passion for the mountainous Australian Bush. Opening night will see a live performance by concert pianist Setsu Masuda and classical guitarist Duncan Gardner– a blend of original composition drawn from Chens love of the lotus and an artists internal struggle finding solace in the act of painting, defining great artists of Singapore and Western Australia. On a recent search I found Eugene Von Guerard's engraving 1865 which has a remarkable similar feel to my new work Beastly Fairy Tales 1 -5 pictured below No 5 "And the beasts from the wild will be led by a Child" 2016 the works can be viewed at Sagra Art Gallery Malvern until July 30th 2016. "The Rose the Butterfly the Bee and the Moth" self -published book has been collected by the Victorian State Library Rare Books ! Designed by Fremantle designer Kim Vu Salamosen , photography Eva Fernandez and printed here locally on recycled paper. It was really important that we could ride our bikes to where ever we needed to source materials in order to have the book made here in Fremantle WA. We wanted to leave the smallest foot print in the making and production of it we also wanted to work with people we liked and had a laugh with... enjoying the whole process. Jane Harrison the author is an award winning indigenous writer her fable that drops its delicate petal has has given all of us working on the project the conviction of beauty and simplicity to pursue this unique project. Mimi Duo Setsu Masuda and Duncan Gardner have extended the visual experience into a musical score. To buy a book and or CDs they are available at my exhibition Reckless Romantics at Sagra Art Gallery in Malvern - Melbourne and here in WA at the Fremantle Art Centres Gallery book shop and also in New Editions Book Shop WA. There is a limited edition of 260. The Album Launch and Live concert featuring the art work and music is at the Church of Resurrection 3 pm 6th of March 2016 , Swanbourne, Western Australia.